Zovus opened his eyes, the sun glaring down upon his face. It was noon, judging by the sun's position in the sky, and Zovus knew that he had to get up. Pirate captains did not sleep on the sand while the rest of the crew stocked the ship with Neocola and Twirly Fruit. However, Zovus did not feel like a pirate captain at all; back on his home island, he felt like a baby Jetsam again. The lush, swaying greenery of Mystery Island had lived on in Zovus's memory since he had left, and it was just as beautiful as he remembered it. That place was paradise to him -- he would not even paint himself pirate to match his new life, because he never wanted to forget his home. Unfortunately, the Neopets of the island did not all remember him in such a kind fashion. "What are you doing back here? We do not need any pirates around to bother us." "Up to the same old tricks, eh, Zovus? Do not even THINK of pillaging my shack!" Why could they not see that he was just another harmless Islander who had aspired to see the world? Just because Jetsams generally liked to bite things and maybe cause a little destruction here and there did not mean that he would bring his own home to ruin. Zovus knew the reason, though. Like him, they all loved their island, and past experience from the nasty Krawk Islanders had taught them to fear pirates. He did not blame them; looking into a nearby pool of water, he realised he did look quite frightening with his large blade, pointed teeth, and captain's waistcoat. In his mind, he began to question his life; why had he become a pirate? Was it really worth it? Would he not rather live on the island in peace? He decided that more important than helping his crew lug supplies back to the ship was finding out if his whole life had been a mistake. 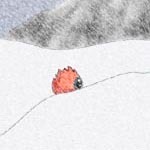 Sighing, he trudged along to his family's hut near the water, hoping to find some answers there. The walk on the shores reminded Zovus of his youth on Mystery Island. He and his friends -- a ragtag group of Neopets always causing trouble -- had played many games, from the Buzzer Game to Pirates and Ninjas. Of course, Zovus always chose to be a pirate in that game. He had longed for life on the high seas, with a crew and a ship to call his own. And he had commanded his group of friends well. Together, under his guidance, they were able to take quite a few Twirly Fruit from the other Islanders. The shore had been their favourite spot, where they always tried to build their own ships to sail off in, and when that did not work, they lay on the sand and imagined what it would be like to become a pirate one day. Zovus wanted to just lay down on the hot sand and reminisce, but he knew he had a purpose; he had to go see his family to see if he had made a mistake in choosing the pirate life. Zovus soon passed an old friend of his. It was Techtech the Techo, always his loyal first mate in Pirates and Ninjas as a child. "Zovus, is that you? I cannot believe it! How have you been?" Tech shouted in joy. "Just fine, Tech, and my hearing is fine, too; no need to shout!" Zovus said. Tech grinned sheepishly; he had never been a very quiet Techo, which had always meant they could never win Pirates and Ninjas with a surprise attack. "You are looking great, Zovus. It looks like you became a Captain, just like you always wanted, huh?" Tech said. Tech interrupted Zovus before he could continue his reminiscence. "Zovus, you are talking crazy. And believe me, I know crazy!" Tech said. Zovus believed him, for sure. "Island life is not for you, too much sitting around and doing nothing. You liked sitting on that sand and staring at the clouds, but you know what? You could never sit still longer than five minutes before you decided to build a sand-ship or talk about how the clouds looked like treasure chests and cutlasses. You could not have done better with your life, Zovus." Tech was a trusted friend, but he was a little crazy, so Zovus found it hard to take him at his word. Despite that, he felt that Tech had stumbled upon some wisdom in his words. Zovus tried to imagine himself enjoying his old Island life, and just could not do it; Gadgadsbogen, the lush sand, and the childhood games of Pirates and Ninjas suddenly did not have the same quality in his memory as they had had before. Zovus began to know the answer to his question about his life. Bidding a final farewell to Techtech, Zovus walked on, his sword clanking loudly on his waist. Zovus knocked on the shack and heard a squeal from inside; scared that his appearance had frightened his mother, he was tempted to turn back. But he held his resolve and waited until the door finally opened to reveal his elderly mother, Jetta. Inside, he could see his father Jet sitting on his chair under a mist fan keeping him wet and cool. "Zovus, is that really you? Oh my, how much I have missed you so!" Jetta said, hugging Zovus tightly. This had been what he missed most of his Island life: his mother's and father's love and affection. At home, he felt the most regret over his pirate life. "Zovus, ever since you left to become a pirate, we have missed you so much! Come in, come in, come in! I have your favourite food: Meat Cake!" Mmm…Meat Cake. Zovus walked in, licking his lips. "Zovus, my boy, how have you been?" Jet asked from his chair. "I have been looking at pictures of you when you were just a small boy, and I cannot believe how you have grown up since then!" "Look, son, I even have a few pictures framed of you above the Meepit cage; we have been taking care of your Meepit for you in case you ever came back, by the way. Go on, give him and the pictures a visit." Jet motioned toward the cage, and Zovus obliged. The pictures were all of various points in Zovus's life, from his first steps to his teenage years. One thing was common among them, though -- in every picture, Zovus seemed to be acting like a pirate. 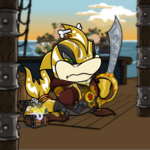 As a toddler he always wore a fake eyepatch everywhere; as a young boy, there were pictures of him and Techtech marching their friends down a wooden board, pretending they were walking the plank; and as a teenager, Zovus was in full pirate uniform, saying goodbye to his parents one last time. Looking down, Zovus met eye to eye with Mr. Meep, his old pirate Meepit. He was asleep, so Zovus did not wake him, but he could not help but feel a longing for his old drive to be a pirate. Jet walked up behind Zovus. "Son, you seem to be having trouble. What is the matter?" Zovus replied, "Papa, I feel like I have made a mistake. Do you think being a pirate was right for me?" Jet stood silently, staring dreamily at the old picutres. "Son, being a Pirate was not what I would have chosen personally for you." Zovus hung his head in despair. "But looking at you now, I know you have made the right choice." Zovus perked up a little at this; Jet continued, "You are a fine young Jetsam, Zovus, and you have made a good life for yourself. You are a Pirate Captain! Anyone good enough to become one of those surely has chosen the right line of life. Now go, son; I think I hear your crew looking for you." Tears in his eyes, Zovus knew his father was right; if anything, his time on Mystery Island had shown him that his memories of the Island, while great, had all been of experiences that had led him to where he was today. It had been his destiny to become a pirate, and he had achieved it. Giving his mother and father a final hug goodbye, Zovus ran into the distance to find his crew. Looking back at the Island as they sailed away, Zovus reminisced once more. Laying on the sand, meeting old friends once again, and his parents' words and encouragement would live on forever in his heart and mind. "I'll never forget you, Mystery Island. I'll be back one day to visit." And with that, the Captain sailed away. Author's Note: Written in honour of my own Jetsam, Zovus. 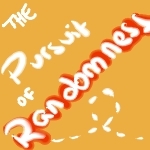 Random events dictate our lives.